And the best might be yet to come. Why? The answer is: the Great Unwind. In the last few years, the Fed was the only hawk in town. When the majority of leading central banks remained very accommodative, the U.S. central bank heroically raised interest rates and started to unwind its balance sheet in a lonely struggle for the normalization of monetary policy. The chart below doesn’t show a significant reduction, but we see that the amount of the Fed’s assets remained roughly stable since 2015 and started slightly declining recently. 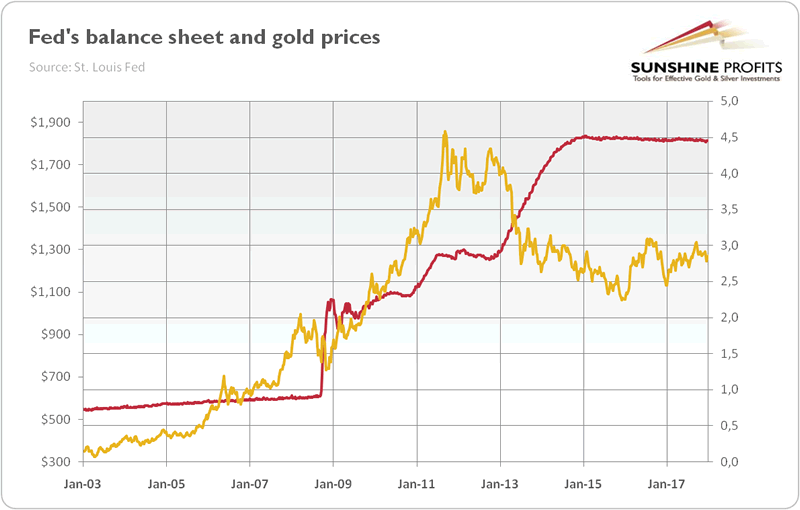 Chart 1: Fed’s balance sheet (red line, right axis, in trillion of $) and the gold prices (yellow line, left axis, London P.M. Fix, in $) from 2013 to 2017. Now, with strong economic momentum in Europe and with the Bank of Japan saying that it would buy fewer long-term bonds, the situation is completely different. Or maybe not, but the investors’ expectations changed. And conjectures based on hopes and fears are what drive the markets. So let’s look at the premises behind these beliefs. First, the growing economic recovery in the Eurozone spurs investors to believe that the ECB will tighten its monetary policy sooner rather than later. The minutes from the December 2017 meeting added fuel to the fire, as investors could read that “members expressed confidence that the euro area economic recovery had now moved into expansionary territory”, which “increased the level of confidence in a sustained return of inflation towards the Governing Council’s aim”. Ten yards for euro bulls. And the political risks may start to abate after the March election in Italy and after German parties form a new government (it is still an unresolved issue, but the main German parties have recently reached a breakthrough in the process, as the Social Democratic Party approved the start of formal coalition negotiations with Angela Merkel's Christian Democrats). Another touchdown. Second, Japan’s economy also started to recover, and the Bank of Japan Governor Haruhiko Kuroda offered a positive view on the economy and inflation. In particular, he said that the core CPI rate was “moving around 1 percent”, an increase from 0 percent three months ago. In the latest quarterly report on regional areas of Japan, the bank also offered its most optimistic view in nearly a decade. The increased inflation and moderate economic expansion prompted investors to believe that the Bank of Japan may wind down its monetary stimulus, especially after the central bank’s announcement about fewer Japanese government bonds purchases. Last but not least, other central banks could also cut back on their asset purchases. In particular, the Swiss National Bank is under less pressure to buy foreign assets as the Swiss franc weakened substantially, returning more or less to the level before the currency was de-pegged. So if the SNB normalizes its monetary policy, it may shake the asset markets. What does it all mean for the gold market? On the one hand, less dovish central banks would imply softer demand for Treasuries and higher bond yields, which gold shouldn’t welcome. On the other hand, the rising expectations of more hawkish ECB and BoJ are likely to sink the U.S. dollar. Indeed, the euro hit a three-year high in mid-January amid rising market odds of an ECB interest rate hike in 2018. Similarly, optimistic comments from BoJ Governor Haruhiko Kuroda sent the yen to a four-month high against the U.S. dollar. As a result, gold prices rallied, which signals that the currency channel is more important for the yellow metal than the yield channel, at least in the short run. Moreover, any surprising monetary tightening in Japan could be the trigger that will halt the current rally in the global stock market, which could be positive for gold, as an alternative asset class. Theoretically, the same applies to the Eurozone, but a paradigm shift in Japan is likely to have a larger impact, as a ECB hawkish turn is more widely expected. And investors shouldn’t forget that many important trends started in Japan – remember January 2016, when BoJ introduced negative interest rates? To sum up, given the global economic recovery, it seems that the major central banks may adopt a more hawkish stance soon. The Fed has already started unwinding its vast balance sheet and hiked the federal funds rate a few times. The U.S. central bank is expected to continue its gradual tightening this year, but this has been largely priced into gold (although, the new FOMC may be more hawkish than expected). Meanwhile, although the normalization may not come quickly, investors are quite sensitive to changes in the prospects of the monetary policies in the Eurozone and Japan. Hence, there is room for further declines in the U.S. dollar – the strongest tailwind for gold.